We know…this sounds like a real departure for us but let’s face it, summer is coming: beach body, engage. We’re firm believers in having cake whenever and wherever you want but we often offset it by suffering through a gym session before or afterwards. Healthy nutrition, as in life, is all about balance and moderation, so if you’re looking to lean out for summer, we have the perfect recipe that’s a healthy treat even when you’re watching your weight, plus it’s a fast dish to cook and a pretty impressive one to have in your repertoire. 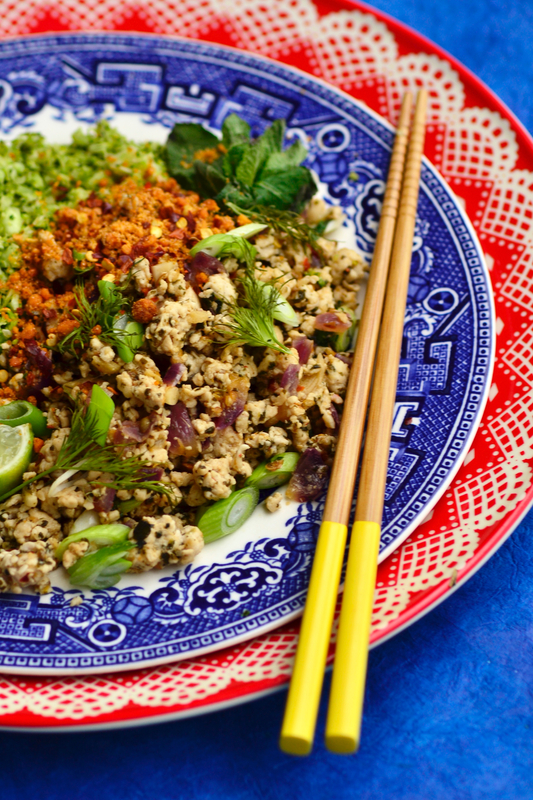 Bursting with flavour and freshness, this Thai/Laos-style laab (minced meat salad also called larb, laap or lahb) is made with lean turkey breast and broccoli ‘rice’, so a bowl or two of this every week ’til summer will ensure you’re on your way to being holiday ready. Then upon return, there’ll be plenty of time to indulge in that cake. 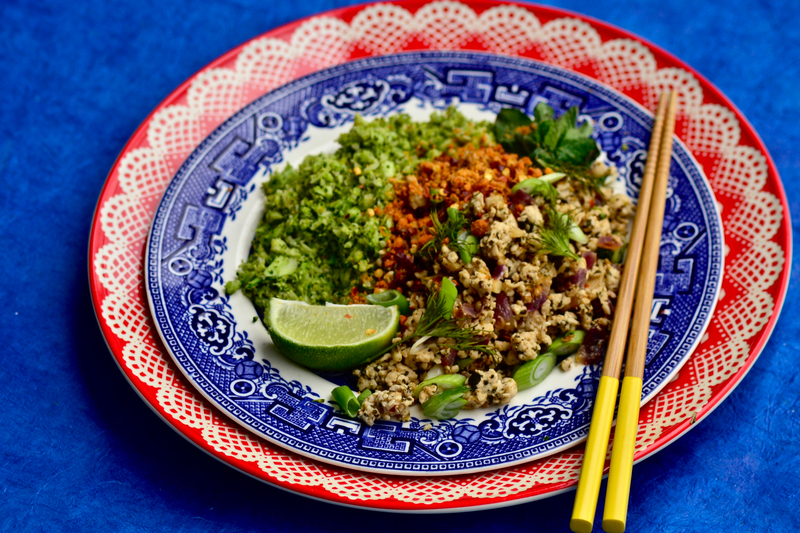 We were inspired by the wonderful Rosa’s Thai Café for this recipe (who Patrick used to work with in his former role in PR) and which has seven different locations across London including Spitalfields, Westfield Stratford City, Carnaby and Soho. Rosa’s is all about fast and fresh Thai dishes cooked to-order and each bursting with incredible flavour – do check them out and tell ’em we sent ya! 2. Then follow with the turkey and with a large spoon keep cutting through it, much like using a cleaver, breaking the turkey down until it’s in small individual chunks, as tiny as it will go. When almost cooked through add the chilli, sugar and salt. 3. Combine the liquids (fish sauce, soy, sesame oil, lime juice) in a bowl and pour over the turkey mixture, allow to bubble down and almost completely evaporate and introduce the spring onions 30 seconds before removing everything to a bowl. 4. For the broccoli ‘rice’, simply pulse the florets in a processor until rice-like and cook in 1/2 tbsp of coconut oil in the same wok for about 2-3 minutes, stirring frequently until just about cooked and toss through the sesame seeds and a little sesame oil before serving for flavour and texture. 5. 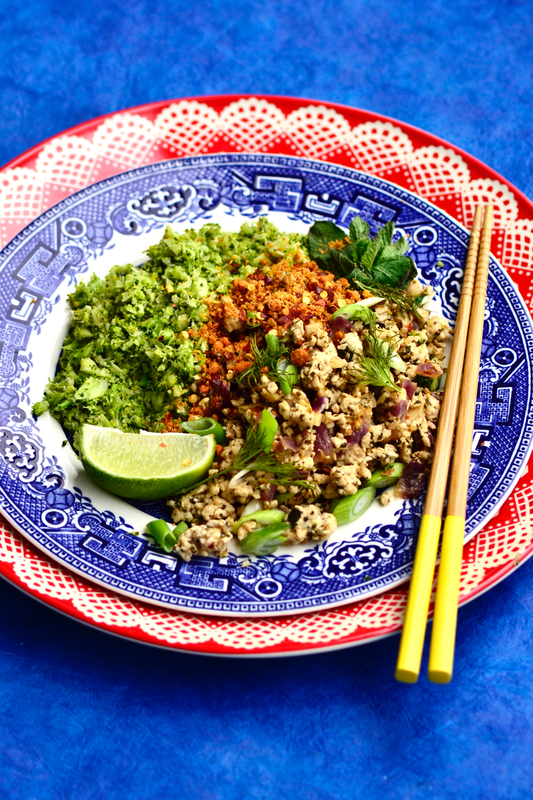 To serve, split the vibrant green ‘rice’ between two plates, matched with the same amount of laab. Top the laab with extra spring onion, crushed peanuts, sprigs of fresh mint and dill and a thick wedge of lime each. This is a mild, so by all means add thinly sliced fresh chilli on top and, of course, eat with chopsticks for the full effect. This recipe for Thai Turkey Laab originally appeared in Gay Times Magazine, where we’re the food columnists with a monthly recipe. Do follow GT on Twitter, Facebook or Instagram and subscribe to the magazine if you like!